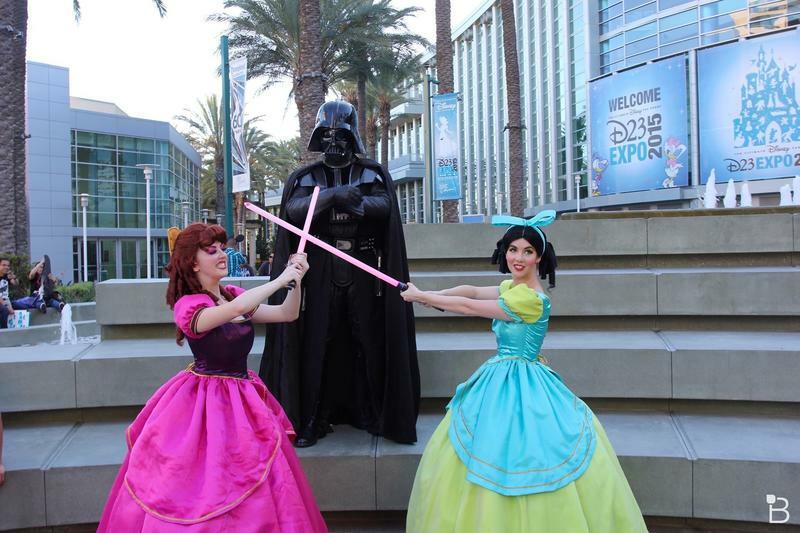 Fans of Disney converged in Anaheim, California this past weekend for the company's D23 Expo, many of them in costume. The D23 Expo has become the place to be for all things Disney, including Pixar, Marvel, Muppets and now Star Wars. This year's event was grandest yet and with the inclusion of LucasFilm into the Disney family the buzz and fun of it all just seems to be even more electric. Lots of news, never before scenes and plans were shown off at various presentations. Captain America, Star Wars, Muppets, Kingdom Hearts III, The Good Dinosaur, just to name a few, and that's just a small portion of all the goodness shared this weekend. My favorite news has to be the announcement of Star Wars theme land in Disneyland and Disney's Hollywood Studios. The future looks really bright for The Walt Disney Company. So many new film projects that will surely keep fans excited, and new ways for fans to experience their favorite characters/heroes at theme parks. Not to mention new video games that allow fans to relive moments (and make new ones) while playing games like Kingdom Hearts III and Star Wars Battlefront. What are you most excited for? Personally I'm most excited for Star Wars: The Force Awakens.